Thanksgiving is right around the corner, which means so is the end of the college football regular season. UCF is still perfect at this point in the season, standing at 9-0 overall and 6-0 in conference play with just two games to go. The Knights are fresh off a 49-24 home win over UConn, but now have to focus on this Saturday’s game at Temple (5-5, 3-3 AAC). Defying Distractions: With Black Friday’s matchup between UCF and USF set to decide the AAC East’s representative in the conference championship game, it could be easy to overlook this weekend’s game at Temple. The Knights are refusing to do so. The Owls stumbled out of the gate at the start of this season, but recently got back on track with back-to-back wins. The defending AAC champions are one win away from bowl eligibility, which certainly adds to the existing motivation that comes from playing an undefeated team. “[They’re] very physical,” freshman Otis Anderson said. “Their record doesn’t really show how talented they are. They work very hard and play very hard, so we have to come with the mindset that we’re playing in a championship game. Flair #ForTheBrand: After booting a 69-yard punt in Saturday’s win over Temple, redshirt junior Mac Loudermilk put on a celebration that quickly spread around the Internet. The loud personalities of retired NFL punter Pat McAfee and current Raiders punter Marquette King have given a newfound spotlight to the art of punting. On any given day, McAfee can be found giving praise to punters and kickers that are doing things that are good “#ForTheBrand.” Loudermilk himself got some of that praise on Saturday afternoon. Initially, it looked like he was content with his usual golf swing as a celebration. But as the ball landed and continued to roll, the celebration quickly became more elaborate. After some vigorous fist-pumping, he took a monster home run swing, complete with a bat flip. Despite the intricacies involved, Loudermilk insisted that it was not choreographed. Tolerating the Temperature: Considering UCF’s typical climate, Saturday’s game at Temple could get awfully uncomfortable. Temperatures will likely be in the 40s and 50s throughout the game, which has resulted in some preparation from players. Players from Florida will certainly be feeling the cold on Saturday, but coach Scott Frost doesn’t think it will be a factor. Of course, he grew up in Nebraska and played his college ball there as well, so he is certainly used to it. Questioning the Committee: Through the first two weeks of the College Football Playoff rankings, UCF has remained at No. 18. The Knights were one of just five undefeated teams heading into play last weekend, yet they were ranked 10 spots under the next lowest undefeated team. There were eight two-loss teams in front of them, which led to a lot of criticism of the playoff committee from both fans and analysts. 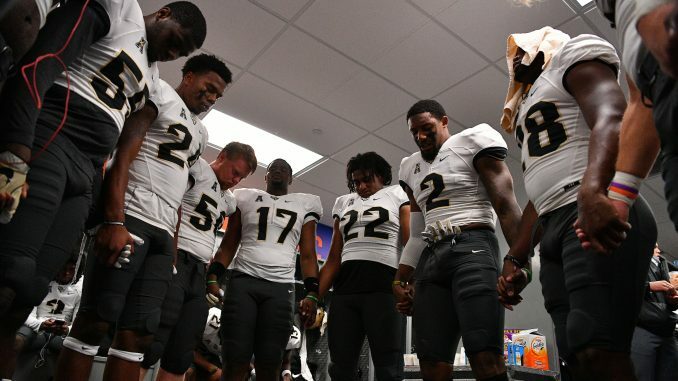 For their part, UCF players remain unfazed by the lack of respect. Even if players and coaches disregard rankings, the fact remains that Group of Five teams face an uphill battle when it comes to respect and a fair shot at the College Football Playoff. The committee justifies its low ranking of the undefeated Knights by pointing to strength of schedule. However, there’s only so much UCF can do about the the schedule it plays, especially considering that Power Five schools often feel like they have very little to gain from playing a top Group of Five team.